Germany loves its holidays, but Halloween hasn't really been on the radar until recently. Sure, Germans are happy to roll in the new season with fall wine and the biggest pumpkin festival in the world, but Halloween as Americans know it has been termed too commercial, silly and - frankly - not German. That said, the country is full of spooky places to get in the Halloween spirit. The country has more than its fair share of haunted places, especially considering the dark patches in Germany's history. Abandoned buildings, dark forests and medieval castles abound, each backstory that involve anything from religious persecution to medieval ghosts to Nazi torture. That is some scary stuff. Don't be scared. These are just the 10 most haunted places in Germany. Disclaimer: While these are well-reported haunted locations in Germany, we do not intend to diminish the real-life horrors that have happened in Germany. Also note that some of the places on this list are on private property and trespassers may be prosecuted. Eltz is one of few castles in Germany that has never been destroyed and its medieval atmosphere is said to cater to the dead as well as the living. Ghosts of medieval knights have been spotted still patrolling the castle. Spandau was once its own city and has roots in the medieval ages. Its Zitadelle (citadel), built in 1557, is one of the best-preserved Renaissance military structures in Europe and offers a museum, periodic concerts, a theatre and even a bat cave. It also has a ghost story. The site has been used for everything from a prison to a military research facility. Back when it was a palace keep, Anna Sydow - the ex-lover of 15th century ruler Joachim II - was locked in the castle by Joachim's son after his passing. She died there and is said to still roam the halls as its infamous Weiße Frau (White Lady). When the Romans arrived in these woods, they were spooked by its impenetrable darkness and named it "Silva Nigra" or "Black Forest". 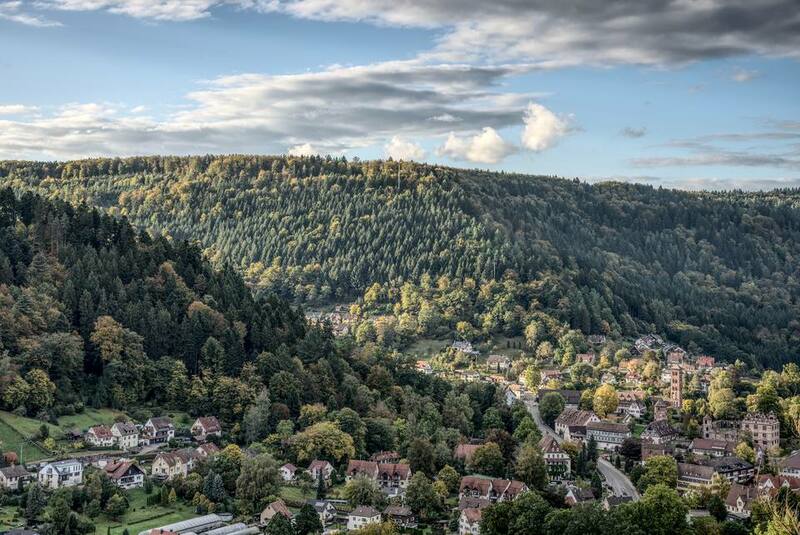 In German this place is known as the Schwarzwald and has developed a fairy tale persona for its iconic cuckoo clock, world-famous spas, and numerous monasteries, castles and ruins. This forest has also been the setting for the Brothers Grimm. While the Grimms didn't invent the scary story genre, Schwarzwald proved ample inspiration. Legend holds that it is haunted by werewolves, witches and even the devil. The tale of der Grossmann is that of a tall, horribly disfigured man with bulging eyes and many arms. Bad children who entered the forest were made to confess their sins to him and the worst children were never found again. Or consider a Grimm original: the story of Die Gänsemagd (Goose Girl) tells of a princess on her way to meet the prince in a faraway kingdom. But the maid accompanying her had ill intentions and forced the young princess to trade places with her. The maid took her magical steed, a talking horse called Falada, and when they arrive at the castle the false princess had Falada killed to hide her misdeed and the real princess work as a goose girl. The real princess has Falada's skull hung over the city's gate, earning the attention of the king. She tells her story and he punishes the false princess by rolling her around the city in a spiked barrel until she died. Waldniel Hoster, also known as the Kent School, was built in 1913 by the Franciscan Order. It was meant to aid the mentally handicapped, but there are horrible tales of abuse and outright murder by the Nazis that ran the school. As the political party embraced the philosophy of euthanasia, the "school" engaged in deplorable practices and was eventually abandoned. It has been empty for decades...at least by the living. Creepy tales of night wails and screams have earned the abandoned school a terrifying reputation, enough so that it has been rebranded as a paranormal attraction with photo tours available. Note that there are glass and nails on the ground and the building is in disrepair so it is not safe for animals or children and you need to wear proper shoes. If you can't make it to the site, there is a photo book for sale. Outside the city of Osnabrück is the site of a sacred pagan temple and graveyard. The site was desecrated by the troops of Charlemagne. Pagan priests were massacred as Charlemagne spread the good word of the Christian faith. They also broke the largest altar stone to prove the supremacy of the Christian God over the pagan gods. On the winter solstice and summer equinox, visitors could hear the screams of those slain and see fresh stains on the rocks. Kloster Wessobrunn is well-known as the site of the Wessobrunn Prayer, one of the earliest written German poetic works. It was kept in the monastic library for centuries but has since been moved to the Bavarian State Library. What is less known is its accompanying nunnery and the legend surrounding it. A sister supposedly broke her vows in the 12th century and hid herself away in an underground passage, eventually dying of starvation. Never at peace, she wanders the halls crying. Different American soldiers have reported waking up to find a Nazi soldier standing over their bed with a blood-covered nurse. Together the two were spotted, whispering in German about their "patient". This experience is unlikely to be repeated as the base was returned to the German government on September 19, 2014. Babenhausen Kaserne has been home to soldiers, both German and American, over time. Though it is now a museum, World War II ghosts still frequent the area. Classic signs of the paranormal like lights inexplicably turning on and off, stomping footsteps and voices heard from the basement have been reported. The town also has an older legend to contend with as a witch was burned at the stake here in the 19th century. She has been blamed for seducing and killing German soldiers. While some people dream of living inside a fairy tale, visitors to Burg Frankenstein can briefly enter the world of a horror novel. This hilltop castle is allegedly the inspiration for Mary Shelley's Frankenstein(although it is hotly disputed if she ever actually visited the castle). The castle was built in 948 BC and inhabited by various Frankenstein. But by the 1600s the Frankenstein family had died out, the last of which in a mysterious manner. The last heir was killed in a chariot accident on his way to visit his one true love, Anne Marie. She is left waiting for him, only to die of a broken heart. She still wanders the castle looking for her lost love as he wanders elsewhere, each desperately trying to reconnect in the afterlife. More pertinent to Frankenstein is the next resident of the castle, Konrad Dipple von Frankenstein. He was a real-life monster in the form of an alchemist, scientist, and grave robber. He was reportedly experimenting with bodies, trying to reanimate the dead. Just like the story, the town’s people eventually stormed the castle but were unable to break through its barricades. Konrad drank one of his own concoctions and died in his laboratory, but one of his creations escaped into the woods and is said to still be roaming the woods. The ghost of Konrad haunts the rooms, still active in his odd experiments. If you believe TV, the site has credentials. The SyFy TV show Ghost Hunters International filmed here and recorded "... significant paranormal activity". Hordes of visitors also believe. This is an authentic setting for the biggest and oldest Halloween festival in Germany. Bernkastel Cemetery contains both Kriegsgräber (German war graves), a Jewish section and another infamous White Lady. A crying woman in white is said to roam the graves. Get the key for the graveyard from the tourist office at Gestade 6 and look for her on All Saints Day when it is customary to light a little candle on each of the tombs. The things that make Burg Reichenstein a UNESCO world heritage site are the things that make it the quintessential spooky castle. Atmospheric dark stone walls? Check. Built in the 11th century to protect the nearby village (now the city of Aachen), the castle underwent the usual cycles of siege, destruction, and rebuilding. Among the many stages, King Rudolph I of Habsburg captured the castle in 1282. It had been controlled by robber barons led by Dietrich von Hohenfels whose cruel rule had crushed the peasantry. King Rudolph wanted to completely destroy this group so he ordered the castle not be rebuilt, and the robber baron executed. Dietrich von Hohenfels begged the king to spare his nine sons and the king offered an impossible bargain: If von Hohenfels's headless corpse could walk past his sons to a line in the sand, his sons would be set free. The executioner struck off his head and amazingly his body made it across the line, but the king did not keep his word and swiftly executed the sons. All ten bodies were buried in St. Clement Chapel. Von Hohenfels's descendants used the chapel to pray for forgiveness, but apparently, it didn't work. Von Hohenfels' soul and headless ghost roam the castle. B215 is a road where strange things have been known to happen. Supposedly it has more accidents than any other road in Germany. An infamous white lady can be found here as well, seen out of the corner of your eye as you drive through the dark. The SMS Emden was completed in 1909 and sailed all over the ocean blue before it was sunk just off Germany's northern coast. It was returning from a long journey and loved ones gathered at the harbor to welcome their sailors home. The harbormaster refused entrance due to personal grudge and the rough waters beat down the battered ship until it sunk within view of land. Under a full moon, the ship and all of its passengers disappeared beneath into the ocean. This tale lives on today and locals report seeing a ghost boat on full moon nights. The story of Rattenfänger von Hameln is better known in English as the Pied Piper. While this has been branded as a children's story, it falls more in the horror/fairy tale genre perfected by the Brothers Grimm. It also inspired poems by Goethe and Robert Browning. During the medieval ages, the town was being decimated by the plague. Desperate to save their loved ones and their own life, they hired a pipe player to lure the town’s rats away. The piper is successful, but the relieved townspeople refuse to pay. Seeking revenge, the piper lures children to their death in the sea. However, this is more than a story. The town that it occurred in is real: Hamlin, Germany. While there are no historical records of a murderous piper, the town has embraced its nebulous reputation. On summer Sundays actors perform the tale once again. Schloss Kransberg has been many things, but its short history as Hitler and then the Luftwaffe's headquarters during World War II have given it a thoroughly negative vibe. Known as Adlerhorst, an extensive bunker was added which linked between the rest of the complex and castle. After the war, the tables were turned and it was used as a prison for Nazi war criminals. In addition to this negative history, people have reported strange occurrences happening. Watch your step and keep your eyes open.